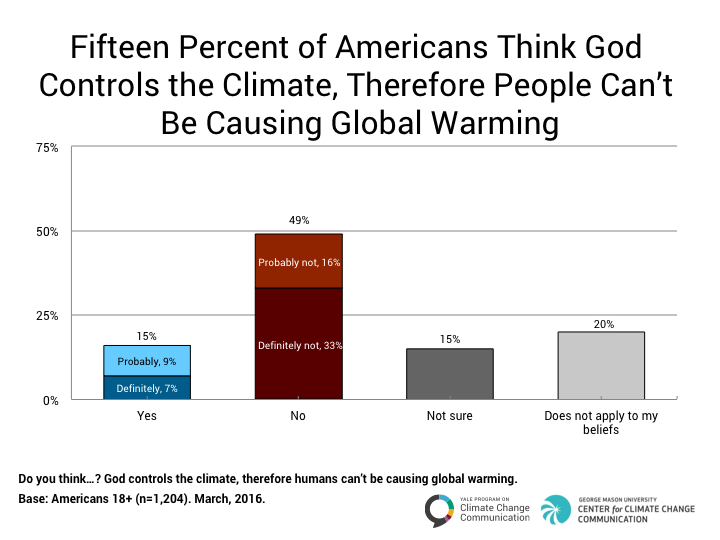 15% of Americans believe that “God controls the climate, therefore humans can’t be causing global warming.” This perspective is particularly strong among Tea Party members (37%), evangelicals and born-again Christians (30%), and Donald Trump supporters (28%). This chart is from our Climate Note entitled “Global Warming, God and the “End Times,” published July 11th, 2016. Roser-Renouf, C., Maibach, E., Leiserowitz, A., & Rosenthal, S. (2016). Global Warming, God, and the “End Times”: March, 2016. Yale University and George Mason University. New Haven, CT: Yale Program on Climate Change Communication.